The Sahel region is highly dependent on agriculture for livelihoods and the wider economy. Agriculture is almost entirely rain fed, dependent upon a 3-4 month rainy season that refills lakes and the rivers which, in turn, irrigate crops. Annual rainfall is highly variable, some studies argue that the concept of ‘normal’ annual rainfall is almost meaningless in the Sahel. 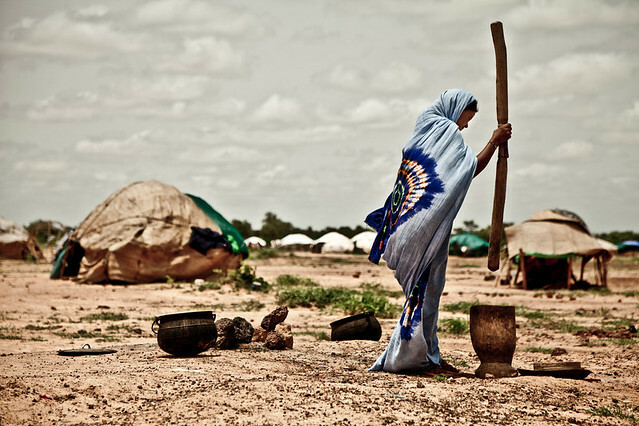 As well as erratic rainfall a number of other factors play an important part in creating the vulnerabilities of the people who live in the Sahel. Over the past half century a combination of land degradation, population growth and misplaced environmental and development policies have contributed to vulnerability. This vulnerability has in turn shaped patterns of migration and displacement. However, the changing climate is only one among a number of factors. Worsening environmental conditions in the Sahel have had a number of impacts on mobility. Historically, droughts have triggered massive displacement. The long drought of the “desiccation of the Sahel” that took place during the 70’s and 80’s created a large scale movement of people. This was primarily internal rather than cross border, and generally from the North to South of countries. It also created extensive rural to urban migration within countries. Where cross border movement did happen it tended to be from the landlocked Sahelian countries to the coastal countries. However the connection between climate change and drought are not simple. The connections between drought and human movement is not simple either. Drought is often the result of natural variations in weather, however these variations are dangerously intensified by climate change. So while it is impossible to state that climate change caused a particular drought, it also not the case that climate change has no effect. 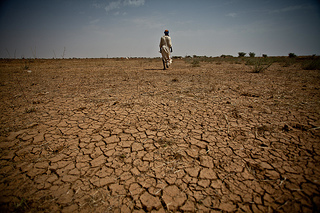 The current understanding is that drought – including in the Sahel – is made more likely by human induced climate change. Further, the effect of drought on movement not simple. Moving usually requires financial resources and as income from farming falls, households have less money with which to move. During the severe drought in the Sahel region during 83-85 there was widespread displacement. However in Mali mobility actually decreased. Households did not have the resources to move, and so stayed where they were inspite of worsening conditions. This is an example of how a changing environment can in fact lead to less mobility, trapping vulnerable people in high-risk areas. Encroaching deserts are threatening much of Africa’s arable land, if trends continue two thirds of arable land could be lost by 2025. The Sahel is particularly vulnerable to encroaching desert, this combined with drought and more perennial water scarcity is threatening livelihoods, the UNFP estimates the the 2011 sahel drought left 11m people without enough to eat. The 2012 current food crisis impacted on 18m people and left 1m children malnourished. This year the UN is again calling for $1.6 bn in humanitarian aid (the same figure as 2012) as 10.3 m face the risk of going hungry in 2013. This warning comes whilst the region is still in the grips of hunger. Gregory White, Climate Change and Migration: Security and Borders in a Warming World, Oxford University Press, 2011.